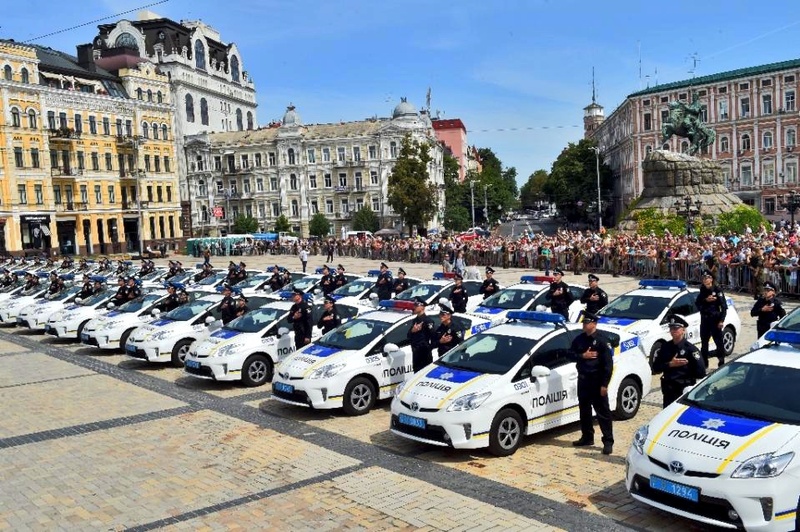 KIEV, Ukraine -- Some 2,000 young, athletic, US-trained Ukrainians on Saturday swore oaths to enforce the law -- and resist the temptation to take bribes -- at the launch of a new police service in Kiev to replace a notoriously corrupt force. 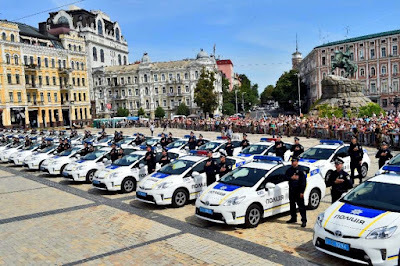 Patrol police stand next to police cars as they are sworn in during an official ceremony in Kiev, on July 4, 2015. Hands on their hearts, the new recruits assembled on a central square sang the national anthem, watched by President Petro Poroshenko, Prime Minister Arseniy Yatsenyuk, Kiev mayor Vitali Klitschko and the US ambassador to Ukraine Geoffrey Pyatt. Stamping out graft among the police has been a key priority of Ukraine's new pro-Western government. "Believe me, your job will be no easier than that of soldiers in the Donbass," Poroshenko told the recruits, referring to the eastern region where government forces are locked in a 17-month conflict with pro-Russian insurgents, in which over 6,600 people have died. "The main danger zone," Poroshenko told the officers, who will patrol the streets and monitor traffic, was "not where the bullets are whizzing but where the banknotes are rustling" -- a reference to the backhanders often sought by traffic police particularly to turn a blind eye to transgressions. The head of the new force is a 28-year-old former commander of a pro-government volunteer battalion, who spent time on the frontline in the east. The successful candidates were selected from over 33,000 applicants and received training from US police. Around one in five are women. Members of the previous force will be required to undergo tests to determine whether they have the fitness level necessary for patrols. Deputy interior minister, Eka Zguladze, a Georgia native among several officials from Georgia and Baltic states to be given senior posts in Ukraine's new administration, spearheaded the shake-up of the force. The US contributed $15 million to the effort, with Japan, Australia, Canada and other countries also chipping in funds. Zguladze, who carried out similar reforms in Georgia under that country's former pro-Western president Mikhail Saakashvili, told AFP she had "the utmost faith" in the new officers. "They are strong, they will succeed," she said. The new service is to be progressively rolled out to other cities, including the southern city of Odessa, Kharkiv in the east and Lviv in the west.